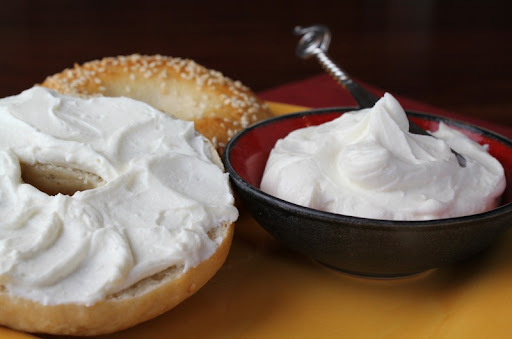 Fresh, creamy and slightly tangy - who knew cream cheese could be this good? 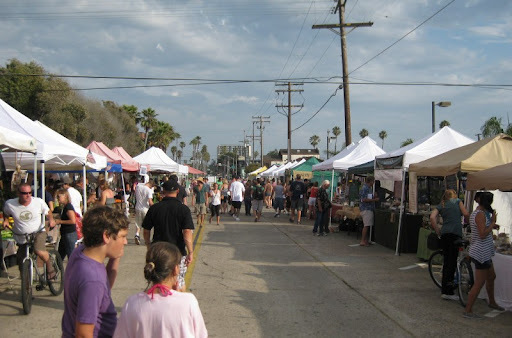 There are certain things we almost always keep on hand and try to make more of as soon as we run out. While Mike is in charge of keeping us supplied with his Taco Shop Hot Sauce, I'm in charge of the cream cheese. I've been making it for a few years now, and have gradually settled on a technique that's easy, reliable and delicious. 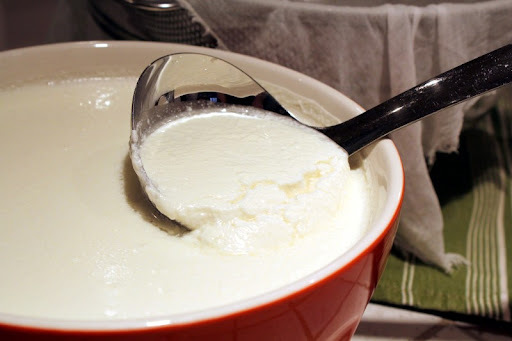 Add starter culture and rennet to room temperature milk and cream. Drain the curds in fine cheese cloth for another day. Add salt and flavorings (optional). Here it is after the first step - the mesophilic starter culture acidifies the milk allowing the rennet to do its magic and turn the milk into a soft gel. It's been sitting on the counter top for about 24 hours. Next put a strainer lined with dampened cheese cloth into the sink and gently scoop in the curds. The cheese is set up almost like a yogurt at this point. 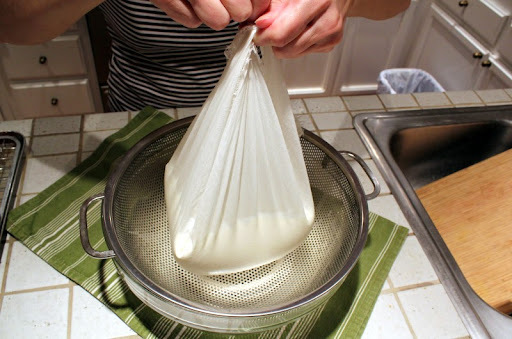 The fine cheese cloth (butter muslin) allows the solids to firm up while the whey drains away. Don't use regular cheese cloth - the weave is too loose. Now it's cream cheese! All that's left is to add a little salt. For variety you can add fresh herbs or garlic and black pepper or whatever you choose. I've tried other recipes which use a lot more cream and were often heated on the stove top, but they were all too solid and grainy. This one on the other hand is light and creamy - almost the texture of whipped cream when it's just made - and it sets up nicely once cooled. We have found cream cheese to be surprisingly versatile as an ingredient in the kitchen. We often use it in place of cream, sour cream, crème fraiche or even buttermilk. It adds a tangy richness to soups, and Mike makes a great mushroom sauce with it. 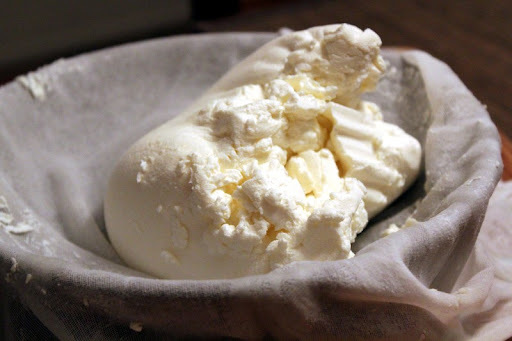 This simple cream cheese has an appealing fresh, slightly tangy flavor and it’s super easy to make. Important: make sure your milk and cream are pasteurized and not ultra-pasteurized. If you can’t find regular pasteurized cream, decrease the milk by a cup and use 2 cups of pasteurized half-and-half instead of the cream. Stir together the milk and cream, then let it come to room temp: leave it in a warm place a few hours, or put it on the stove top on very low, or put it into a barely warm turned-off oven (do not microwave). Sprinkle the mesophilic starter over the milk, let it sit a couple minutes, and then stir it in gently, but thoroughly. Add the rennet and stir another 60 seconds. Cover and let sit 18-24 hours. 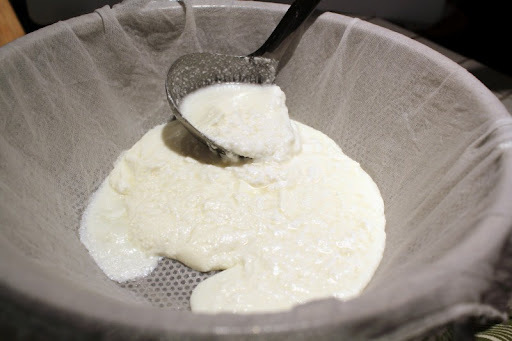 Gently ladle the curds into a colander lined with fine cheese cloth -- I like to do this over a large bowl. Carefully lift the corners of the cheese cloth and tie them together. 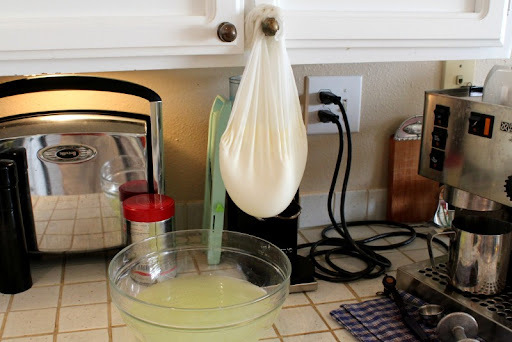 Hang from a cupboard knob or other convenient place and place a bowl beneath to catch the drips. Leave alone for 12-24 hours. The longer you wait, the stiffer the cheese will be. 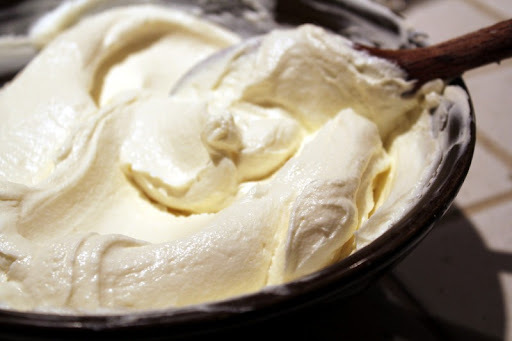 Turn the cream cheese into a bowl and use a wooden spoon to mix in the salt. (Note - the salt will dissolve and become more uniform tasting after the cheese has rested for a few hours.) If you want to add flavorings (herbs, garlic, pepper, fruit) to portions of the cream cheese it's easiest to that now while it’s warm. Or it's great plain too. 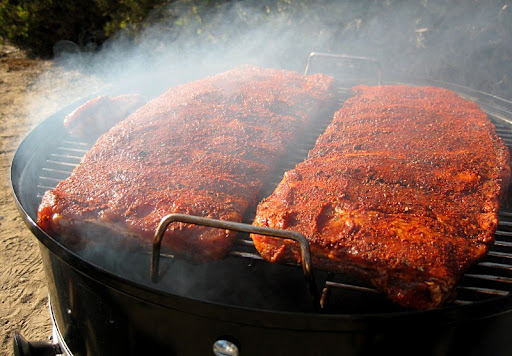 Ok, so this picture is actually from a few years ago, but we've got a nice rack of pork spare ribs all coated with spice rub and ready to hit the smoker later today.